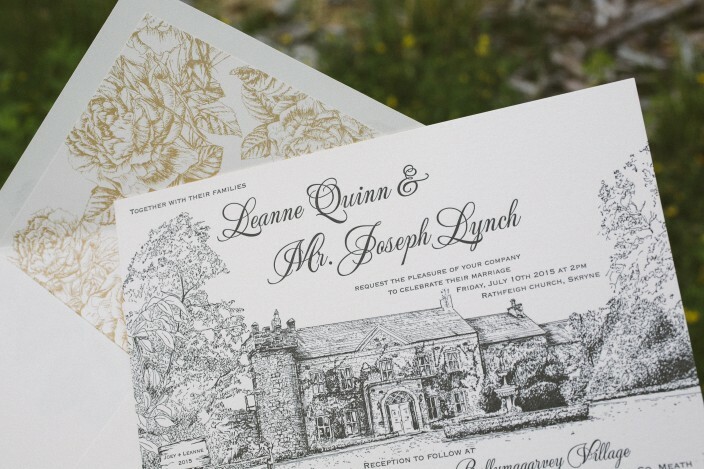 Leanne and Joseph worked with Appleberry Press to create their intricate letterpress wedding invitations depicting their wedding venue, Ballymagarvey Village. 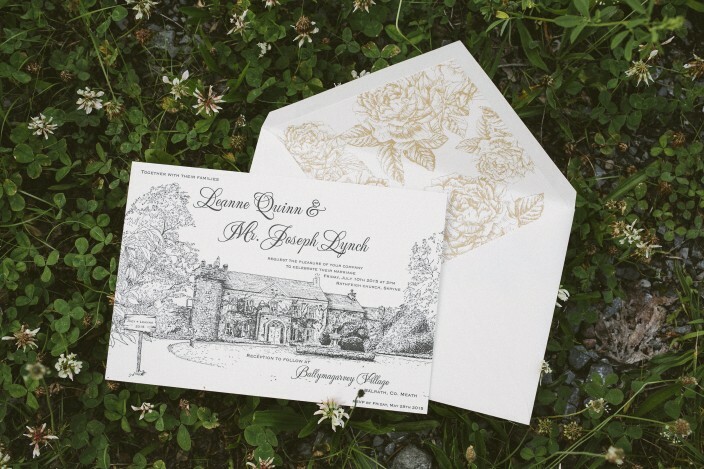 Printed in classic black ink, the invitations include incredibly fine detailing — right down to the idyllic ivy vines growing along the house! 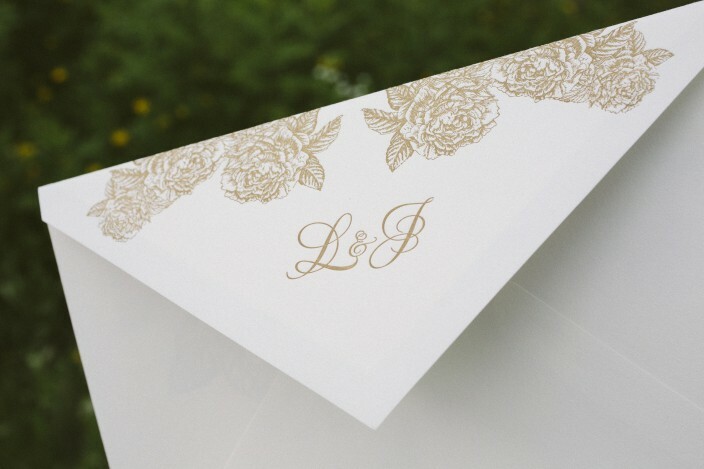 Lush gold florals added a romantic touch to the invitation envelopes, and continued on to the envelope liners. 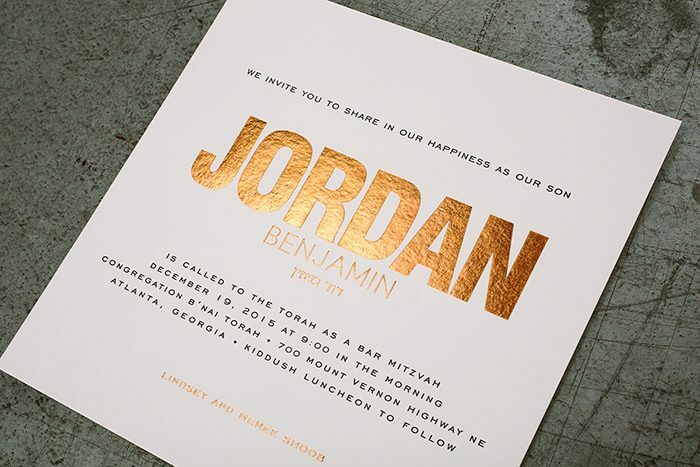 Roll out the red carpet: these custom gold foil B’nai Mitzvah invitations from Simply Put are showstoppers. 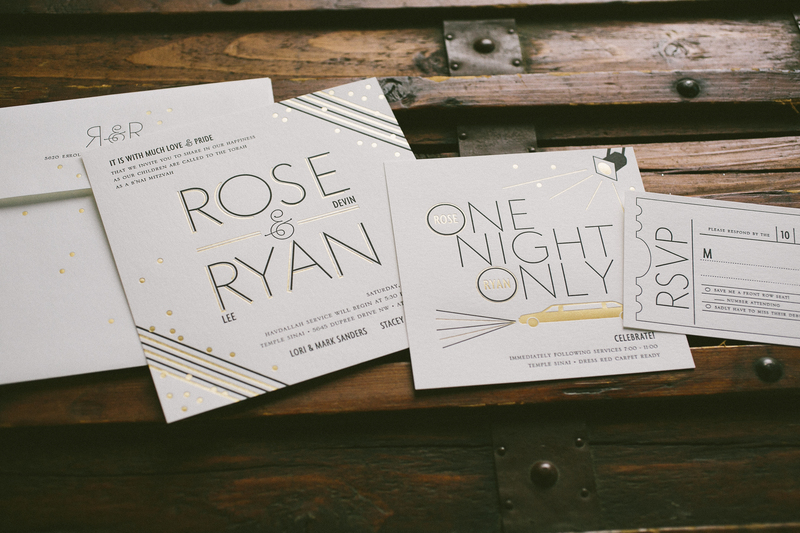 We printed an invitation, party card, and reply card for this dazzling set, which boasts modern, Hollywood inspired fonts and playful cinematic motifs — perfect for a glamorous celebration. 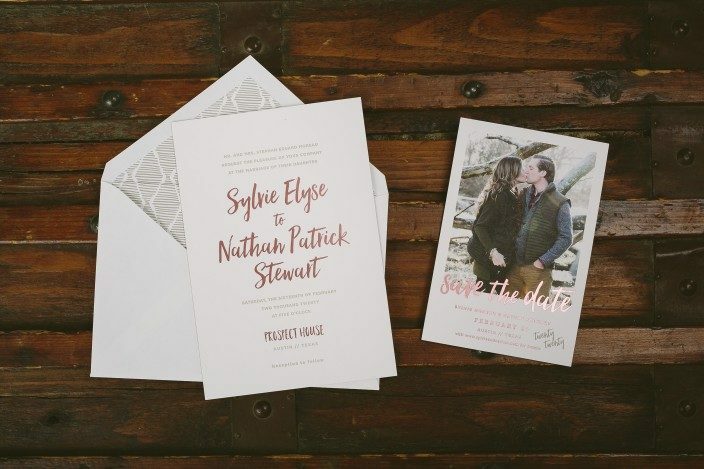 Inspired by our Haddington design, Sierra and David’s letterpress save the date postcards help set the tone for their September wedding in California. 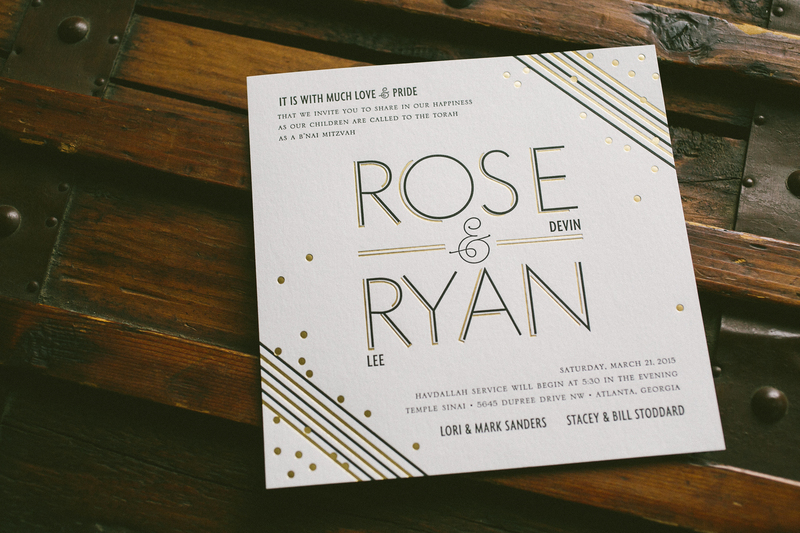 Their letterpress wedding invitations were printed in black ink to match, with envelope liners in our pink vintage rose pattern adding a pop of color to the set. 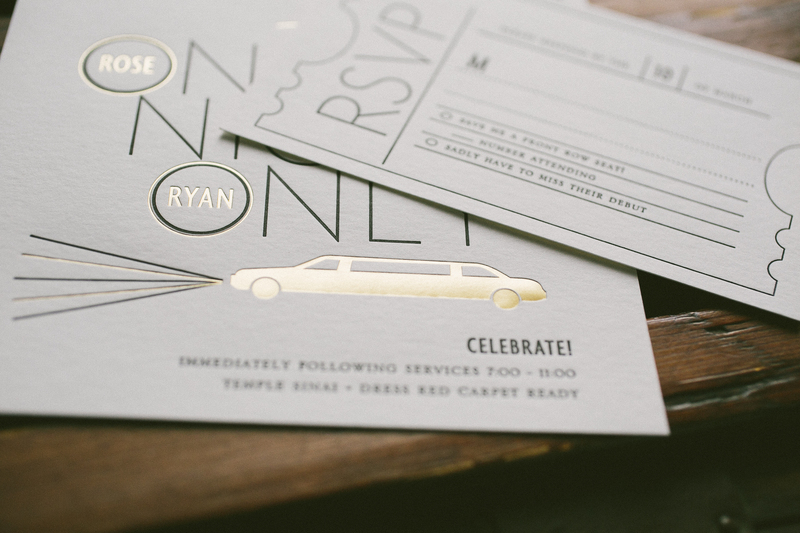 We loved working with our friends at The Pleasure of Your Company on these unique 40th birthday party invitations. 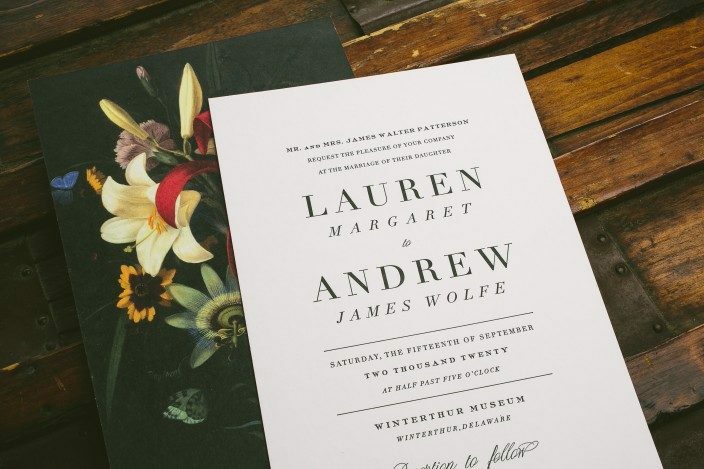 These artistic invitations were letterpress printed in classic black ink on our white bamboo paper, with creative design elements reminiscent of paint splatters printed in silver shine foil. 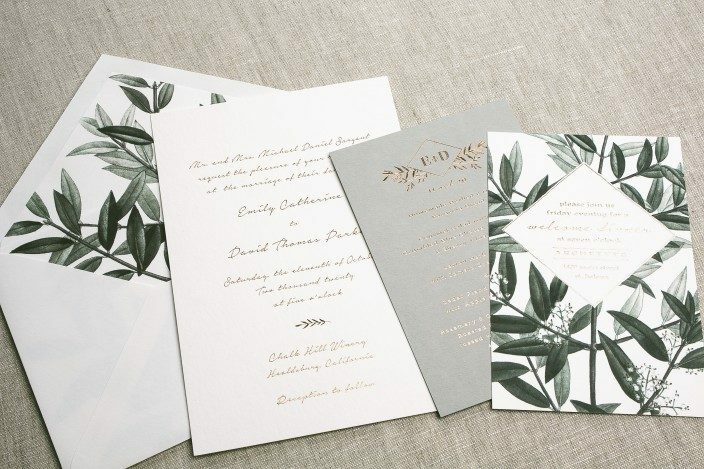 We worked with The Social Page to create these sleek custom wedding invitations for Amanda and Christopher’s country club celebration. 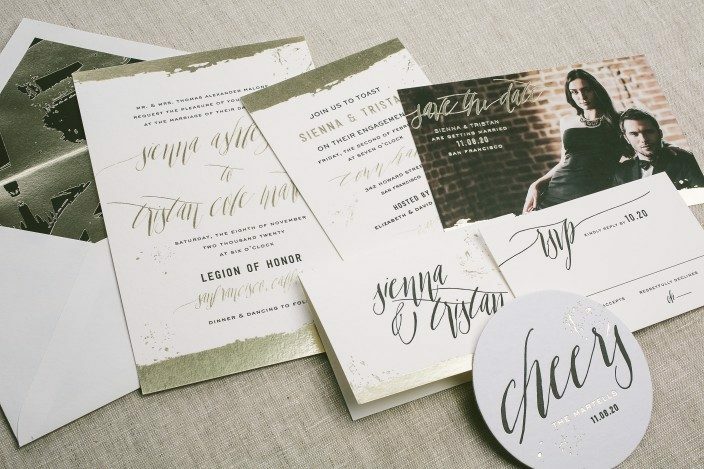 The couple customized our Chablais invitation with silver matte foil and black ink, and used our Stella calligraphy font to emphasize key text throughout the suite. 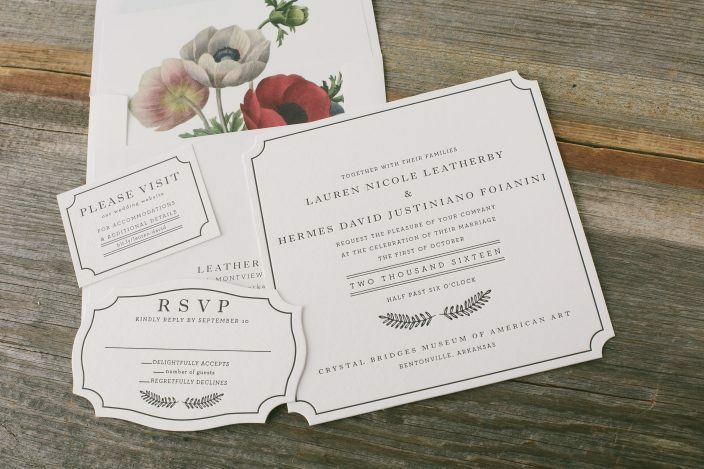 A custom map was included on the directions card to help guests find their way, and a chevron patterned envelope liner added a chic finishing touch! 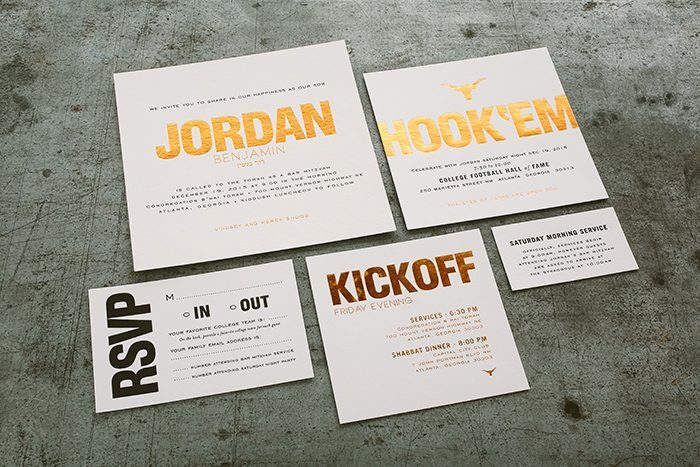 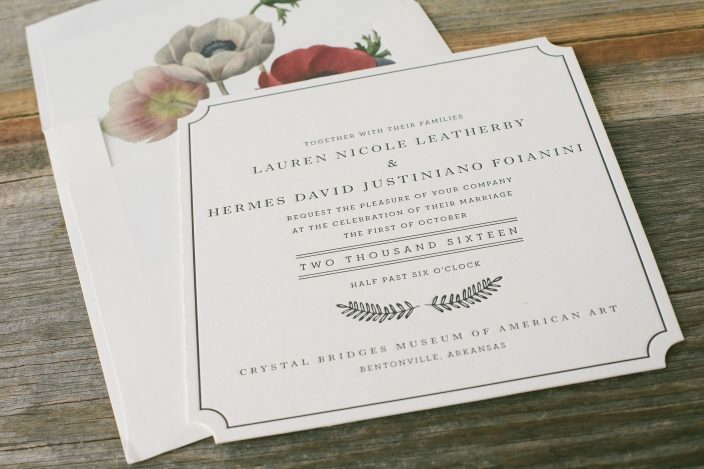 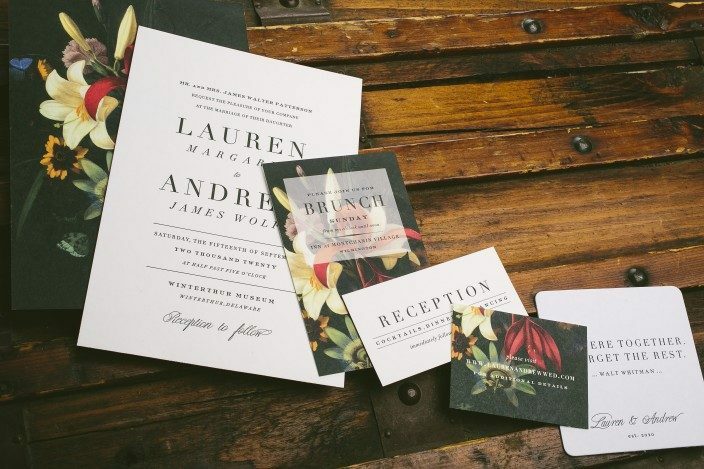 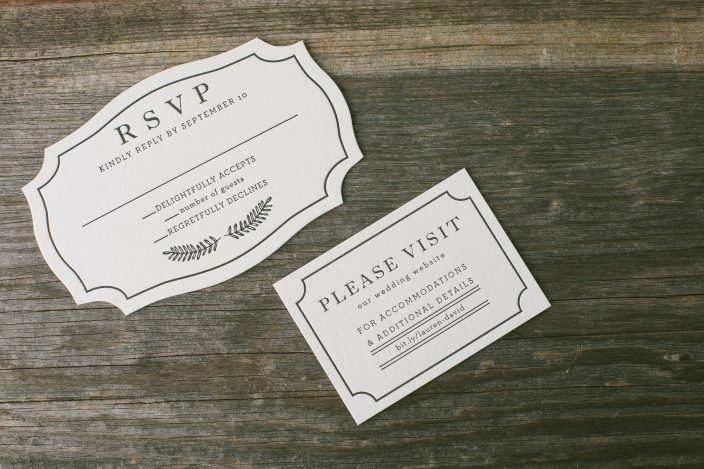 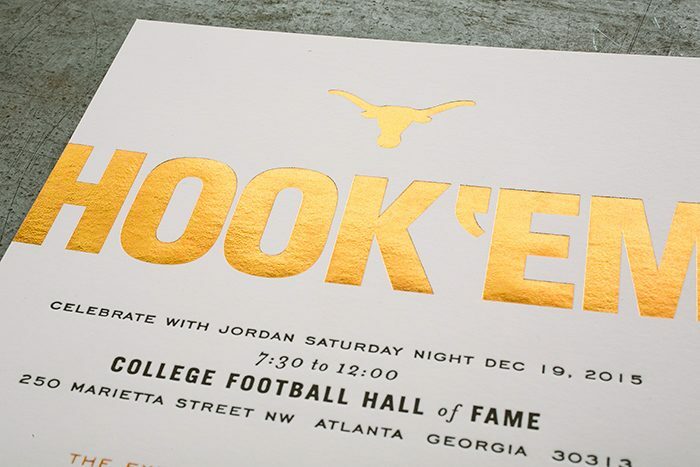 Aren’t these letterpress social notes from Menage Fine Stationery pretty? 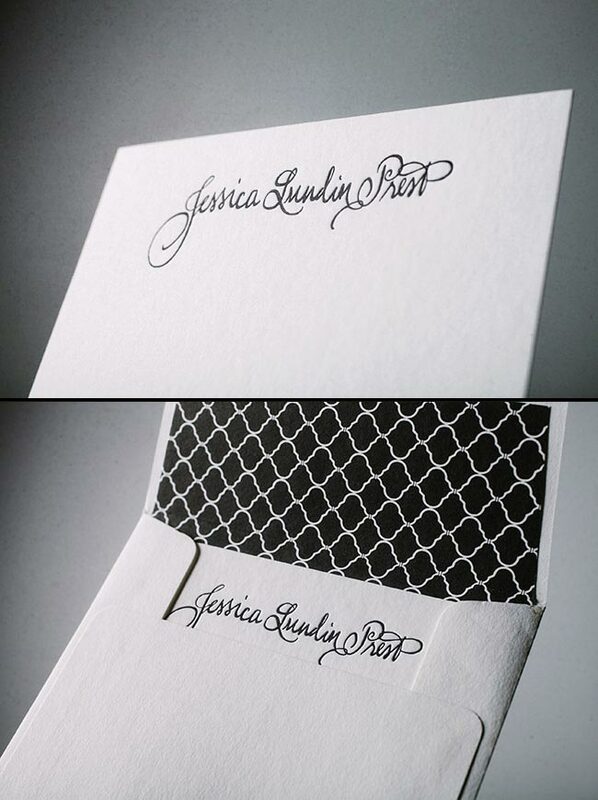 We printed these flat social notes in classic black ink and created a pretty black and white envelope liner in our grand champlain pattern to match.